Our Board and Management visited Malmø and Copehagen ahead of this weekend’s Board Meeting. Our delegation was treated by the County of Malmø for a lunch at Värhemsskolan on Thursday, hosted by Kommunalråd Andreas Schønstrøm and Polical Secretary Sylvia Bjørk. We were given a comprehensive presentation of the work done at Borgarskolan, leading up to an intentional agreement to follow up co-operation with their IB Diploma Department. 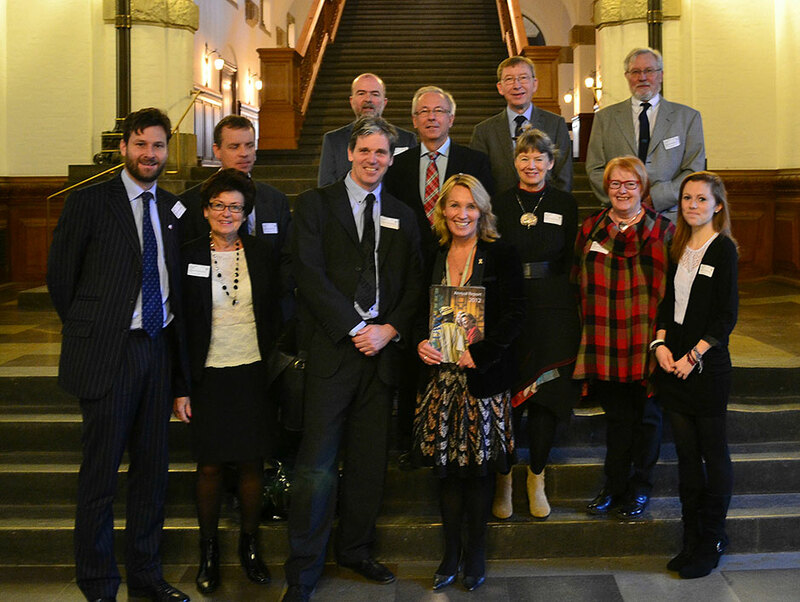 On Friday, former Foreign Minister Lene Espersen received us at Christiansborg and gave a talk on the work of the Danish Parliament. The Board meeting was held at the Danish Norwegian Association, Schæffergården. All our students are now equipped with their own laptops. Many thanks must go to the classes of 2002 and 2003 for helping us to equip those with a need – and for leveling the conditions for our students. 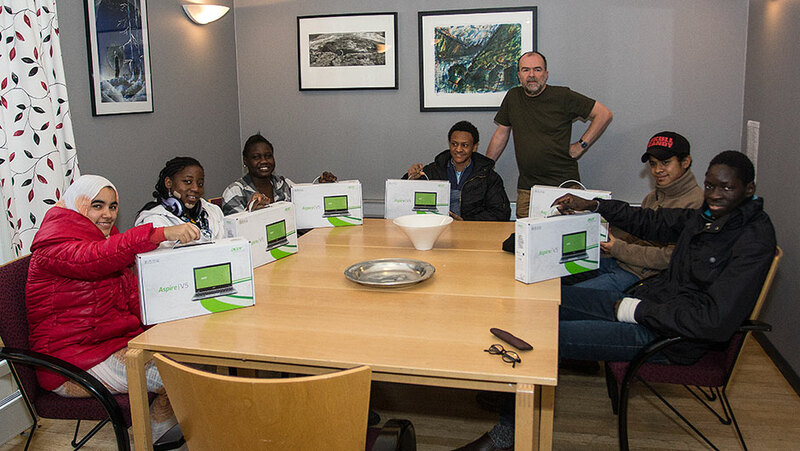 In the picture, IB Coordinator Peter Wilson handing over the laptops donated by the alumni fund. Last Saturday some of our students participated in the celebration of International Children’s Day and the “Colourful Førde” World Food Festival at Førdehuset. 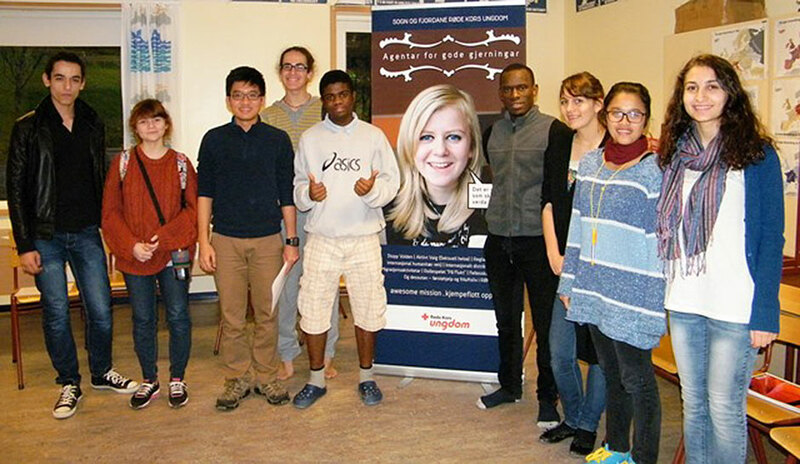 A group of Nordic-speaking students helped host the children’s activities, which were led by professionals. Another group of our students accompanied children from local mottaks (centres for asylum seekers) to the various activities. The smaller kids enjoyed Moroccan music, dance and yoga groups while the older could try out folding origami birds or learning dance steps in Michael Jackson style with Herbie Scarbie, who also visited our theatre students at the College earlier in the week. There was also a chance to learn a little song with beautiful and colourful Indonesian musical instruments. 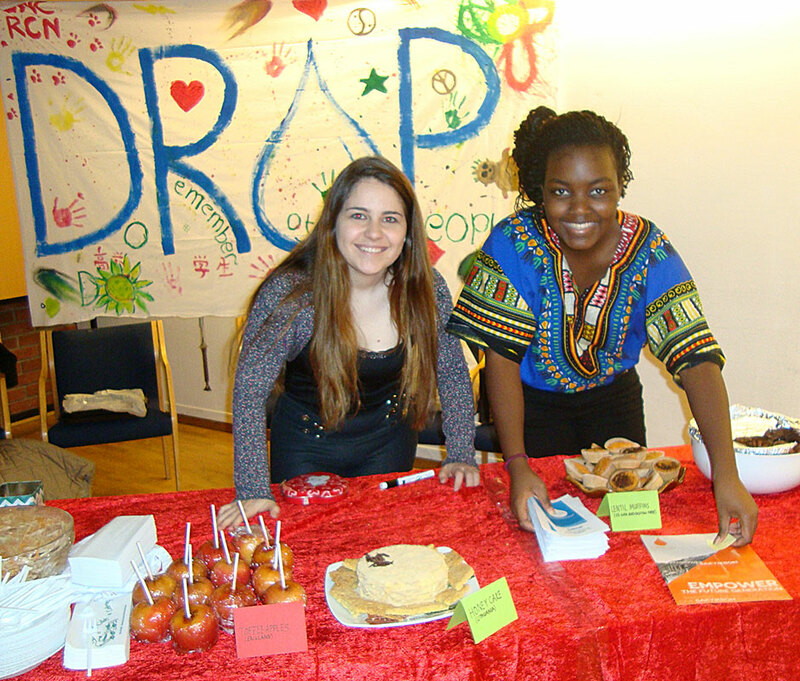 Barbara and Daniel Toa-Kwapong and their talented students served delicious Western-Saharan rice, peanut soup, doughnut-like pastry, Nepalese tea and even sushi made fresh in the DROP corner of the main food hall. It was a fine adventure to walk around the tables full of Asian, African and European specialties and pick something from here, something from there. The DROP group was exhibiting and selling souvenirs from around the world, among them beautiful paintings made by Hungarian Roma children from the Realpearl Foundation. In addition to this, students from the College performed on the main stage, entertaining a packed room with Balinese and Indian dances and a song sung by Daniel, our first year from Nigeria, accompanied by Thata from Indonesia on guitar. Over the past weekend at the College, the Red Cross Youth in Sogn og Fjordane held an instructor course for students as part of their activities promoting sexual health. Twelve students from the RCN participated. They were both 1st and 2nd year students from the UK, Norway, Tanzania, Bolivia, Indonesia, Costa Rica, Belarus, Tadjikistan and Libya. The content of the course was appreciated by the participants because it can be used to activate discussion among young people. Icebreaker games and other practical exercises in communication were amongst the activities demonstrated to facilitate the learning process. There was much to learn about this subject: for some of the students it was the first time they had learned anything about STI’s. They completed the course and will now have some understanding, and the tools necessary to promote discussion and raise awareness. The feedback to the organisers was good, especially when it came to the activities demonstrated. The fact that the course also had a focus on how the participants can make a programme for youth in their own local societies, and think locally about the issues raised seemed to motivate them. How to communicate well in a group situation and more….. This was an instructor-education course that will enable the participants to more confidently communicate information about sexual health in a non-threatening, and non-discriminatory way. Thanks go to RCN teacher David Robertson for organising the day and to workshop leaders Christian Vik from Sogn og Fjordane Red Cross, Sirianne Pidic from the District Council for Youth and Hilary Hamper, former RCN nurse, now working in the local community.